The benefits of high school athletics are well known as is how football in particular is very much a part of the fabric of local communities all across this country. Falls Church is no exception. Falls Church City Public Schools’ former and long serving School Board Member Kieran Sharpe mentioned these safety concerns on several occasions during school board meetings during his tenure on the board. 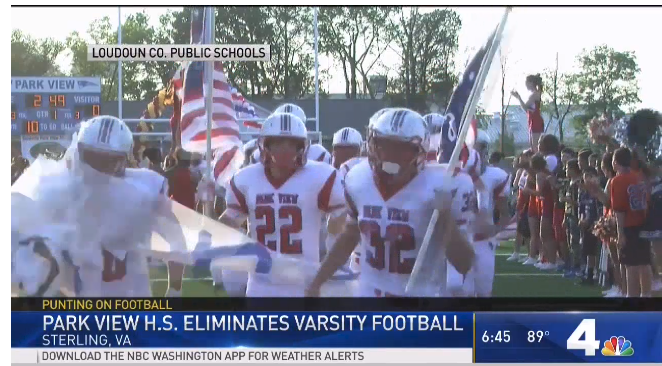 However this never led the board to ever seriously considering cancelling the Football program for the George Mason High School (GMHS) Mustangs. The GMHS athletic program staff take safety very seriously. Under the leadership of Mason’s highly accredited Athletic Training Coordinator, Vicki Galliher, George Mason has put in place strict safety protocols. As any student athlete that has taken a hit can tell you, try as you might, no one returns to the field if not cleared by Galliher. More about the study can be read here. Football for high schoolers has a lot of merits: creates comradery, builds character and allows athletes to problem solve with their peers. As with any sport or activity, it can be dangerous. I think GMHS does a great job of teaching the athletes correct ways to tackle and play the sport safely. Look at the changes to our playgrounds – no swings, no see saws, no monkey bars, no dodge ball – no fun. I enjoy going to GMHS football games and look forward to attending this year. I think it is a great sport and brings the community together. Let’s keep our sports. Studies have shown that soccer is just as dangerous for head injuries (especially for girls) so we must recognize that all sports have inherent risks. The benefits are amazing if you ever played sports. My son played football at Mason and had such a great experience! You are so right Sharon, all sports have inherent risks! I can’t imagine Mason without football! This, of course, isn’t a local story. NBCNews.com: The Friday night lights start to dim on high school football. Doesn”t GMHS provide the data to VDOE? The VDOE data is different then the information on GMHS website for 2017 that says 31% of students in the IB Programme (see below). The * did not appear to have a definition on the web page: Currently at George Mason High School: * 87% of George Mason juniors and seniors participate in the IBDP. 27% of students in the Class of 2015 received the IB Diploma a 92% success rate. 28% of students in the Class of 2016 are currently pursuing the full IB Diploma. 31% of students in the Class of 2017 are currently pursuing the full IB Diploma. As our program continues to expand and serve more students we continue to achieve excellence. As I former high school football player myself, I can appreciate some of the benefits. Nevertheless, several International country comparisons show that the US educational results are far behind those of other advance economies (usually around 20th place). I’d strongly prefer to spend resources on improving these educational outcomes, rather than competitive team sports, which at the college level and above are riven with corruption. One of the reasons of the high costs for the proposed new GMHS building is the fact that it will have 3 gyms. I havent never been able to determine how much of the operating costs of the school system go to the athletics program, but I suspect a lot. Football is particular requires a lot of expensive equipment, besides being dangerous. having said all the above, I recognize the need for physical education. However, PE should benefit all students, not just those who have an interest or talent in a particular sport and should focus on building & maintaining healthy bodies rather than pushing kids beyond reasonable physical limits which can often lead to permanent damage to their bodies.